Toxoplasma gondii is an obligate intracellular protozoan that infects up to one-third of the world’s population . Toxoplasmosis can present with varied signs and symptoms, of which asymptomatic lymphadenopathy is the most common. Bone marrow granulomas are very rare with a reported incidence between 0.3 and 2.2% . The vast majority of cases of bone marrow granulomas are attributed to infections and hematologic malignancies. We report a case of bone marrow granuloma due to toxoplasmosis, presenting as isolted thrombocytopenia in an immunocompetent patient. A 54-year-old man was referred to us from the surgery department with thrombocytopenia detected during preoperative evaluation for inguinal hernia repair. His past was uneventful and did not have any complaints at present, except for the hernia. On examination he was fully concious and oriented, and systemic examination was normal except for left direct inguinal hernia. His hemoglobin was 14.8 g/dl, total leukocyte count was 5600/µl [neutrophil (N) 49% lymphocyte (L) 42% eosinophil (E) 06% monocyte (M) 03%], platelet count was 60 000/l, and erythrocyte sedimentation rate was 9 mm in 1 h. Renal function tests, serum electrolytes, liver fuction tests, urinalysis, and chest radiograph were all normal. Peripheral smear showed thrombocytopenia ([Figure 1]). HIV, hepatitis B virus surface antigen, hepatitis C virus serologies, rheumatoid (RA) factor, and anti nuclear antibody (ANA) were negative. Prothombin time, activated partial thromboplastin time, was normal. Bone marrow examination showed granuloma ([Figure 2]). Bone marrow culture for fungus and tuberculosis was negative. Tuberculin skin test was negative. Tests for weil felix, Brucella More Details serology, rickettsial fever, and VDRL were negative. Serum angiotensin-converting enzyme level was normal. Toxoplasma immunoglobulin (Ig)G and IgM antibody titers were high. A six-fold rise in IgG antibody titer was seen in serial sample obtained 3 weeks later. Therefore, a diagnosis of bone marrow granuloma due to toxoplasma resulting in thrombocytopenia was made and he was started on trimethoprim–sulfamethoxazole. His repeat platelet count after 1 month improved to 124 000/l. 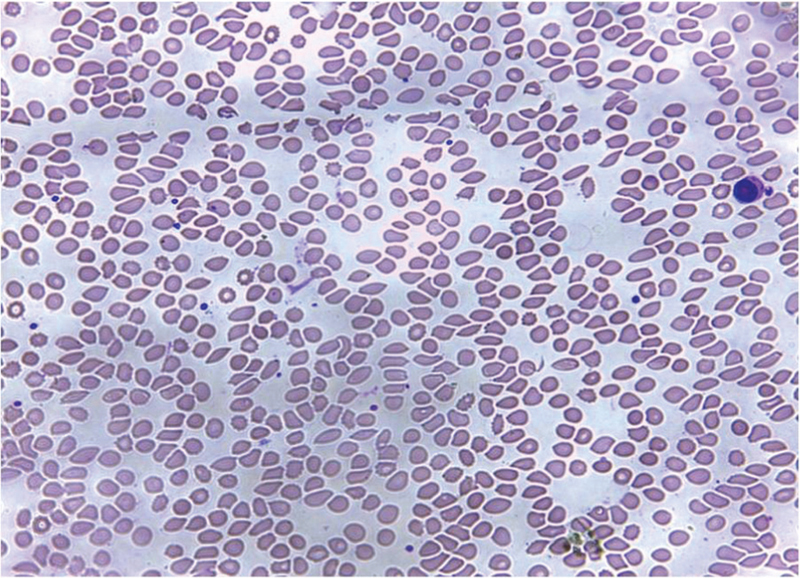 Figure 1 Photomicrograph of peripheral smear showing thrombocytopenia. 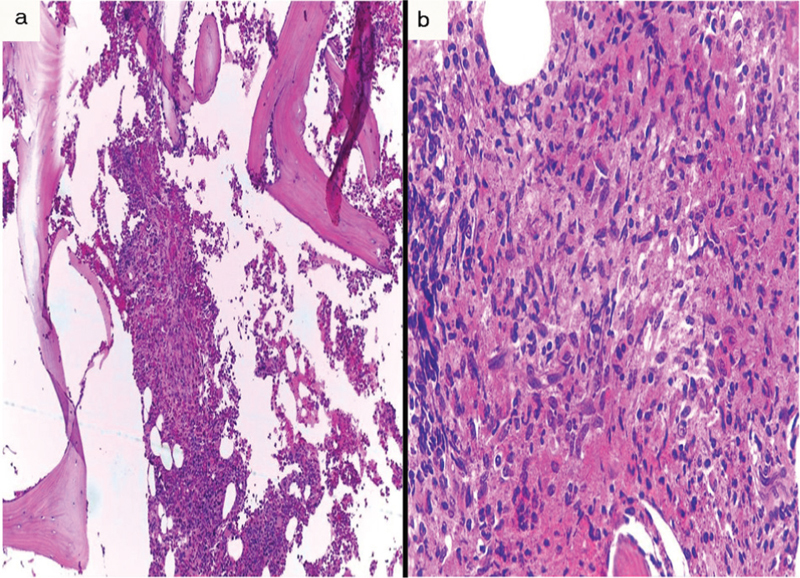 Figure 2 ×10 (a) and ×40 (b) micrograph of bone marrow biopsy showing epitheloid cell granuloma on hematoxylin and eosin stain. Infection of humans with T. gondii is common worldwide, with the prevalence varying according to environment, eating habits, and age. Infection occurs through direct ingestion of food or water contaminated with cat feces containing oocysts, ingestion of tissue cysts in uncooked meat, and transplacental infection of the fetus . Clinical presentation of this infection depends on the age and immune status of the patient. In the majority of patients who are immunocompetent, both adult and pediatric, primary infection is usually asymptomatic. In ∼10% of this patient group, a nonspecific and self-limiting illness is manifested as an isolated cervical or occipital lymphadenopathy lasting less than 4–6 weeks. The lymph nodes are usually discret, nontender, and do not suppurate. After the acute phase, almost all patients will remain chronically infected with tissue cysts that are dormant and cause no clinical symptoms. Myocarditis, polymyositis, pneumonitis, hepatitis, encephalitis, and chorioretinitis are the other rare manifestations. Bone marrow granuloma is not a frequent finding in a bone marrow biopsy. The incidence ranges from 0.3 to 2.2% . This nonspecific finding is indicative of a systemic process with an extensive list of possible causes including viral, bacterial, and fungal infections, malignant diseases, autoimmune diseases, drugs, and sarcoidosis. Most of them are attributed to infectious sources and hematologic malignancies. Although some specific pathologic findings can point toward certain diagnoses, such as caseation in tuberculosis, Reed–Steinberg cells in Hodgkin’s lymphoma, and poorly organized granulomas in HIV infection, these findings are uncommonly seen in the marrow. They are not specific and do not usually show characteristic features that typify a specific diagnosis. Therefore, the diagnosis of an underlying condition is made mainly based on epidemiologic, clinical, laboratory, and radiologic data . Toxoplasmosis is reported to cause granulomas in bone marrow in immunosuppressed patients . Bone marrow granuloma caused by toxoplasma in immunocompetent individuals was not reported previously. Diagnosis of toxoplasmosis can be done directly through PCR, hybridization, isolation, and histology, and indirectly by serological methods. Direct methods are limited by difficulties encountered either in the growth of parasites in-vivo or in the identification of tachyzoites by histochemical methods. Serologic tests are used routinely for diagnosis. Pyrimethamine plus sulfadiazine is the preferred treatment and trimethoprim–sulfamethoxazole is an alternative. Specific antitoxoplasmal treatment is not indicated in immunocompetent patients unless there are severe and persistent symptoms. In our case, we started him on trimethoprim–sulfamethoxazole, because he had significant thrombocytopenia. To the best of our knowledge, bone marrow granuloma due to toxoplasmosis in an immunocompetent individual presenting as isolated thrombocytopenia was not reported previously. Taila AK, Hingwe AM, Johnson LE. Toxoplasmosis in a patient who was immunocompetent: a case report. J Med Case Rep 2011; 5:16. Eid A, Carion W, Nystrom JS. Differential diagnoses of bone marrow granuloma. West J Med 1996; 164:510–515. Montoya G, Liesenfeld O. Toxoplasmosis. Lancet 2004; 363:1965–1976. Kvasnicka HM, Thiele J. Differentiation of granulomatous lesions in the bone marrow. Pathologe 2002; 23:465–471. Gologan R, Dobrea C, Popa L, Gioada L, Dragomir M. Multiple myeloma in remission complicated by bone marrow granulomas. Rom J Intern Med 2003; 41:323–328.